Every time I look at this postcard, I think it's fake. It looks like an architectural model. Or perhaps a futuristic set from everyone's favorite 1960s British marionette action series, Thunderbirds. But, no. This is a real photograph. Or, at least, I'm 98% convinced at this point that it's a real photograph. It's definitely a real place. This is Sestriere, a picturesque mountain village in northwestern Italy, along the French border. It's primarily a ski resort that sits about 6,700 feet above sea level and served as the venue for the alpine events at the 2006 Turin Olympics. "Sestriere is one of Italy's oldest purpose built resorts. ... The two hotel towers that dominate the skyline have become the symbol of the village. They were built in the 1930s by FIAT’s founder Giovanni Agnelli to provide a holiday retreat for the workers in the FIAT factory down in Turin." I culled some additional information on Sestriere history from its Italian-language Wikipedia page. It was founded in October 1934. Agnelli had purchased the land that became the village for 40 cents per square meter. The two hotels (seen in this postcard) are known as The Towers and were designed by Vittorio Bonadè-Bottino in the Italian Rationalism style. 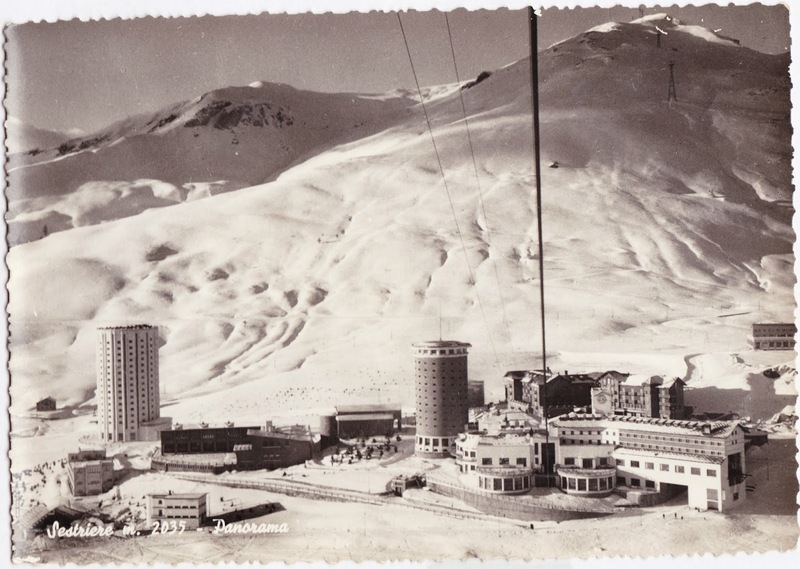 After World War II, Agnelli's nephew, Giovanni Nasi, continued the development of Sestriere. Nasi served as the village's mayor from 1948 to 1980. Nope. Not going to this football party. FOVA #13: Radium Remedies Co.